ICSC Texas members convened in Austin on February 6 for ICSC's Day at the State Capitol to lobby members of the Texas Legislature on issues important to the retail real estate industry, including Wayfair implementation and remote sales tax collection. ICSC members conducted individual meetings with more than 25 Texas Senators and Representatives, received legislative updates from senior legislators, met with a representative of the State Comptroller’s Office, and watched the Chief Justice of the State Supreme Court deliver his State of the Judiciary Address. Texas has finalized Administrative Rules to implement the ruling in the Wayfair case. The Rules took effect on January 1, 2019, and Texas will begin collecting sales and use tax from remote sellers who have sales in excess of $500,000 on October 1, 2019. However, additional legislative changes are necessary to further modernize and simplify sales and use tax collection and address sales made through electronic marketplaces. ICSC members effectively advocated for those legislative changes and why they are important to retail real estate during individual meetings with legislators and their staff. Thank you to ICSC Texas Government Relations Co-Chairs Kim Carmack and Tracy Bratton for their work in making ICSC Texas Day at the Capitol a success. 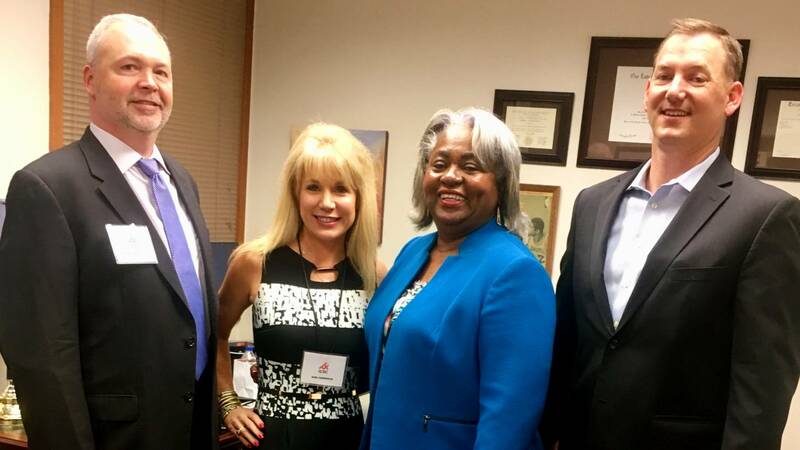 L to r: ICSC Texas Government Relations Co-Chairs Tracy Bratton (Doucet & Associates, Inc.), Kim Carmack (Rohde Ottmers Siegel Realty Inc.), Representative Barbara Gervin-Hawkins and Shawn Kirkpatrick.